In Amplitude Modulation Theory, the amplitude of a carrier signal is varied by the modulating voltage, whose frequency is invariably lower than that of the carrier. In practice, the carrier may be high-frequency (HF) while the modulation is audio. Formally, AM is defined as a system of modulation in which the amplitude of the carrier is made proportional to the instantaneous amplitude of the modulating voltage. Note that phase angle has been ignored in both expressions since it is unchanged by the Amplitude Modulation Theory process. Its inclusion here would merely complicate the proceedings, without affecting the result. However, it will certainly not be possible to ignore phase angle when we deal with frequency and phase modulation. From the definition of AM, you can see that the (maximum) amplitude Vc of the unmodulated carrier will have to be made proportional to the instantaneous modulating voltage Vm sin ωmt when the carrier is amplitude-modulated. and in the first pair n = 1. When a carrier is amplitude-modulated, the proportionality constant is made equal to unity, and the instantaneous modulating voltage variations are superimposed onto the carrier amplitude. Thus_when there is temporarily no modulation, the ampli­tude of the carrier is equal to its unmodulated value. When modulation is present, the amplitude of the carrier is varied by its instantaneous value. The situation is illustrated in Figure 3-1, which shows how the maximum amplitude of the amplitude-modulated voltage is made to vary in accordance with modulating voltage changes. Figure 3-1 also shows that something unusual (distortion) will occur if Vm is greater than Vc (this distortion is a result of overdriving the amplifier stage). This, and the fact that the ratio Vm/Vc often occurs, leads to the definition of the modulation index given in Equation (3-4). The modulation index is a number lying between 0 and 1, and it is very often expressed as a percentage and called the percentage modulation. It has thus been shown that the equation of an amplitude-modulated wave contains three terms. The first term is identical to Equation (3-1) and represents the unmodulated carrier. It is apparent that the process of Amplitude Modulation Theory has the effect of adding to the unmodulated wave, rather than changing it. The two additional terms produced are the two sidebands outlined. The frequency of the lower sideband (LSB) is fc – fm, and the frequency of the upper sideband (USB) is fc + fm. The very important conclusion to be made at this stage is that the bandwidth required for Amplitude Modulation Theory is twice the frequency of the modulating signal. In modulation by several sine waves simultaneously, as in the AM broadcasting service, the bandwidth required is twice the highest modulating frequency. Amplitude Modulation Theory may be represented in any of three ways, depending on the point of view. Figure 3-2 shows the frequency spectrum and so illustrates Equation (3-7); AM is shown simply as consisting of three discrete frequencies. Of these, the central frequency, i.e., the carrier, has the highest amplitude, and the other two are disposed symmetrically about it, having amplitudes which are equal to each other, but which can never exceed half the carrier amplitude [see Equation (3-7), and note that m > 1]. 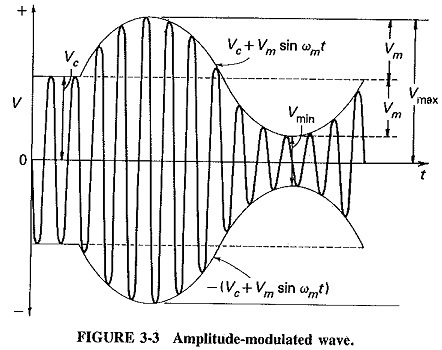 The appearance of the amplitude-modulated wave is of great interest, and it is shown in Figure 3-3 for one cycle of the modulating sine wave. 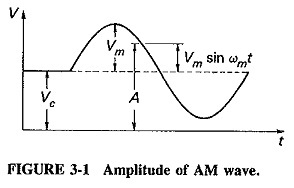 It is derived from Figure 3-1, which showed the amplitude, or what may now be called the top envelope of the AM wave, given by the relation A = Vc + Vm sin ωmt. The maximum negative amplitude, or bottom envelope, is given by -A = -(Vc + Vm sin ωmt). The modu­lated wave extends between these two limiting envelopes and has a repetition rate equal to the unmodulated carrier frequency. Equation (3-10) is the standard method of evaluating the modulation index when calculating from a waveform such as may be seen on an oscilloscope, i.e., when both the carrier and the modulating voltages are known. It may not be used in any other situation. When only the rms values of the carrier and the modulated voltage or current are known, or when the unmodulated and the modulated output powers are given, it is necessary to understand and use the power relations in the AM wave. Finally, if the main interest is the instantaneous modulated voltage, the phasor diagrams depicting the three individual components of the AM wave may be drawn. It has been shown that the carrier component of the modulated wave has the same amplitude as the unmodulated carrier. That is, the amplitude of the carrier is un­changed; energy is either added or subtracted. The modulated wave contains extra energy in the two sideband components. Therefore, the modulated wave contains more power than the carrier had before modulation took place. Since the amplitude of the sidebands depends on the modulation index Vm/Vc, it is anticipated that the total power in the modulated wave will depend on the modulation index also. This relation may now be derived. Equation (3-14) relates the total power in the amplitude-modulated wave to the unmodulated carrier power. This is the equation which must be used to determine, among other quantities, the modulation index in instances not covered by Equation (3-10) of the preceding section. The methods of doing this, as well as solutions to other problems, will be shown in exercises to follow. It is interesting to note from Equation (3-14) that the maximum power in the AM wave is Pt = 1.5Pc when m = 1. This is important, because it is the maximum power that relevant amplifiers must be capable of handling without distortion. In practice, Amplitude Modulation Theory of a carrier by several sine waves simultaneously is the rule rather than the exception. Accordingly, a way has to be found to calculate the resulting power conditions. The procedure consists of calculating the total modulation index and then substituting it into Equation (3-14), from which the total power may be calculated as before. There are two methods of calculating the total modulation index. If the square root of both sides is now taken, Equation (3-17) will once again be the result. It is seen that the two approaches both yield the same result. To calculate the total modulation index, take the square root of the sum of the squares of the individual modulation indices. Note also that this total modulation index must still not exceed unity, or distortion will result as with overmodulation by a single sine wave. Whether Amplitude Modulation Theory is by one or many sine waves, the output of the modulated amplifier will be zero during part of the negative modulating voltage peak if overmodulation is taking place.